There’s the siren, then the yipping begins and immediately one of the coyotes walks towards the other — they like yipping together — and they continue their chorus side by side. When they’re through with the yipping, the female scratches some bugs on her body, and the male snaps at the bugs in the air in front of him. Finally the male coyote, as he hears dogs barking in response to his yipping, sits to watch the activity in the distance. After a moment of watching, these two continue their trekking. Click on either of these images to read the rest of this extremely short (200 words) and to-the-point piece on the importance of vigilance if you have a dog in a coyote area. Note: The article, in its shortness, or possibly because of a misunderstanding by its author, is missing some important points. Most important, coyotes avoid humans, so if you don’t have a dog with you, just keep your distance to help yourself and the coyote not feel crowded or threatened. And, even if you have a dog with you, you would never challenge a coyote as described in this article unless it had come very close or was coming directly at your dog. Otherwise, leash and walk away, and always keep your distance. The point is to avoid any interaction and a confrontation always. Dad coyotes are out for a while in the mornings to perform “sentry duty”. With so many dogs in the parks, you can be sure Dads are concerned and worried about the areas where youngsters have been stashed to stay safe. Most of the time, a dad will just lie and watch, sometimes with one eye shut, from a location with a broad view. He is not only watching, he is also making himself visible. Making himself visible during this time frame is a communication device for letting others know that he is there — the territory is taken. This is about territorial behavior — about protecting one’s turf. During the time that he’s lying there, he may become uneasy over a particular dog he’s spotted in the distance. If this happens, he’ll sit up or stand to watch more keenly. This may be all he does before lying down again. However, being the good caregiver and guardian that he is, he may hurry after the dog and follow to assure himself that the dog is headed away from, and not towards, a pupping area — sort of “escorting” the dog away. If the dog owner is not vigilant, the coyote could get close and might even deliver a messaging nip to the dog’s behind — cattle-dog fashion — to get the dog to hurry along. All dog owners should be aware of the possibility of this behavior. Remember that coyotes don’t allow other coyotes into their territories: If YOU were not there with your dog, the coyotes would be trying harder to let the dog feel unwelcome. This does not happen frequently, but I’ve seen it a number of times. What should a dog owner do? I’ve posted this before, but it needs to be emphasized. 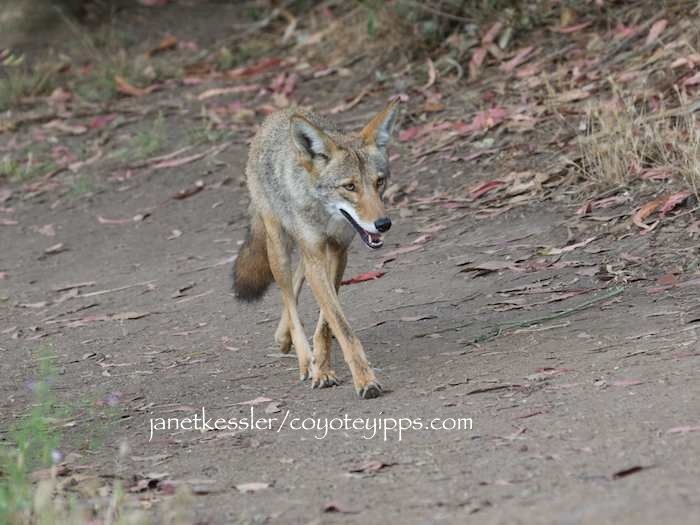 Remember that coyotes are not interested in tangling with humans — rather, they want to message the dog. First and foremost, if you see a coyote, always leash and continue moving away from it. You should keep your dog in sight at all times. Don’t let your dog lag far behind you where he’s out of your line of vision. If you see a coyote following and getting too close, you need to stop and shoo it away. Simply turn around and glare at the coyote. Eyeball him eye-to-eye to let him know you mean business and that you are targeting him. You can add emphasis by lunging or stepping towards the coyote. You want to move in his direction without getting close. 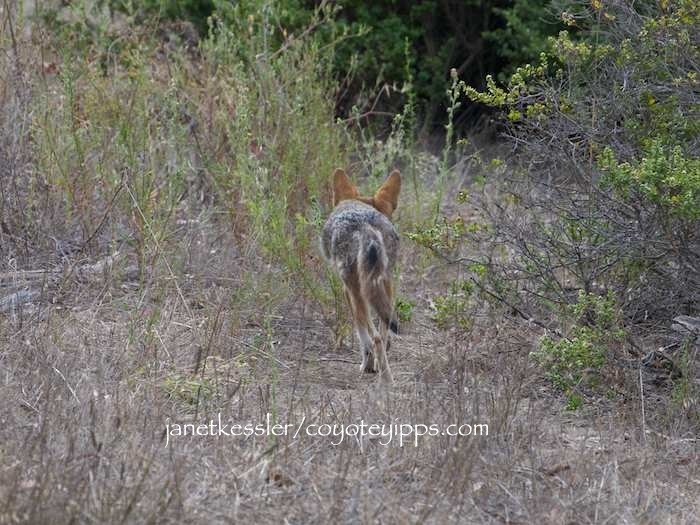 One walker recently told me that she pointed at the coyote by extending her arm out far and pointing her finger at the coyote in a commanding sort of way as she stamped her foot and lunged at a coyote. By eyeing the coyote and pointing at it, there will be no mistake about who your message is for. Picking up a small stone and tossing it in the coyote’s direction is always effective. Either way, you are moving in his direction, or moving something in his direction, which is what causes him to move. Then turn around and walk on, but continue looking back. If he continues to follow, you should repeat this more emphatically — it may take several attempts before the coyote gets the message. Never run from a coyote. NOTE, that if a coyote is close enough to engage with your dog, you’ll need to be ferocious in your shooing it off. Please see the demonstration in the “Coyotes As Neighbors” YouTube video (you can google this). It’s best never to let a coyote get this close in the first place. Down the path — the same path I was on — came a coyote, sauntering along with a purposeful gait, looking as though he had a specific destination in mind. Three other people, each with a leashed dog, were on that path in front of him, and one woman without a dog was behind him at some distance. The people were all walking towards a social and dog play area. 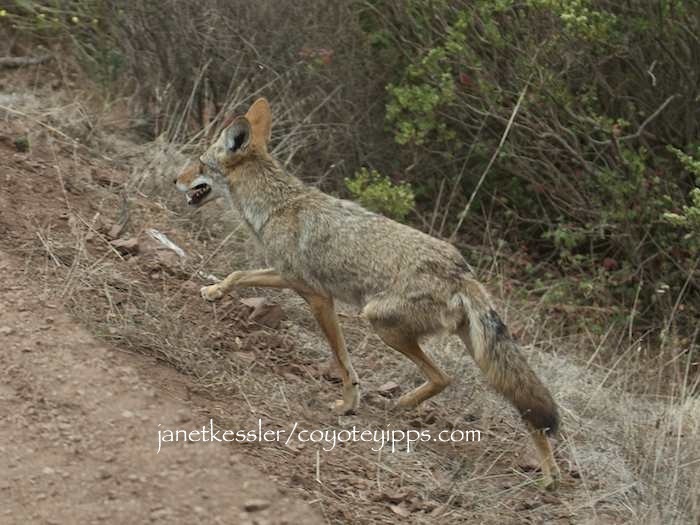 The coyote kept walking on the path, knowing that he would get through undisturbed if he kept his distance. He looked so secure and self-assured, even though he was a small wild animal and there were people and dogs around. We were all “obstacles” — not unfriendly obstacles, to be sure — and he would have to get around us. He was able to maintain a safe distance from everyone because we all were walking in the same direction. Then, an unleashed dog with a reputation for chasing coyotes appeared with its owner coming in the opposite direction — walking towards everyone else. Everyone, including the coyote, knew this dog and its coyote-chasing behavior well. 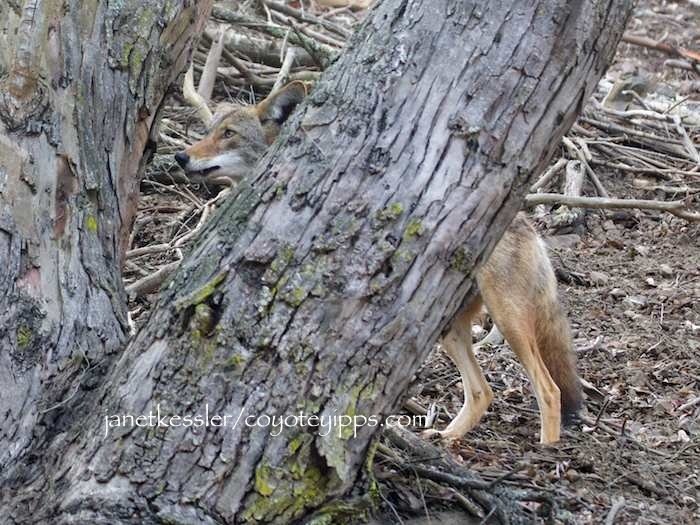 The coyote took stock of the situation and quickly veered off the path and behind some trees. He was still visible, but not so obviously now. One of the dog walkers told me that he did not want to see the coyote being chased which inevitably led to human/human confrontations — he decided to leave. Everyone else stopped walking and watched. Someone mentioned to this dog owner that a coyote was behind the trees, but, oddly, her dog seemed oblivious to its presence this time. Still, she leashed her dog and continued walking on as if everything was normal, and her dog, none the wiser, never even saw or sensed the presence of the coyote! As she disappeared around a bend, the coyote again jumped out onto the trail and continued on his way, still purposefully directed. Another of the dog walkers told me he felt the coyote, who was coming in his direction, might be “following” him as he walked away, but the coyote veered off the path and distanced himself over a scrubby hill. He was obviously just on his way somewhere: just passing through, and everyone there was on his side, knowing his passing through would be uneventful if we kept the dogs away from him, and it was!